Laro averted a huge upset from Ceres to stay unbeaten. TAGUIG—The Philam Life 7's Football league was back at the McKinley Hill Stadium on Sunday with its Matchday 2 for both its youth and seniors division. Once again, youth teams had proven that football in the country is growing and that youth talent only need an avenue to practice their skills in the sport. Youth teams opened the Matchday 2 of the league with an action-packed set of games with the Kaya youth teams seemingly dominated the league in all four age groups. Giving them a run for their money is the Simon Greatwich –led G8 and Bohemian Sporting Club. Over at the Seniors Division, the boys from Tondo had once again proven that they are a force to be reckoned with at the league as they whipped H&J All-Stars with an impressive 3-1 victory. 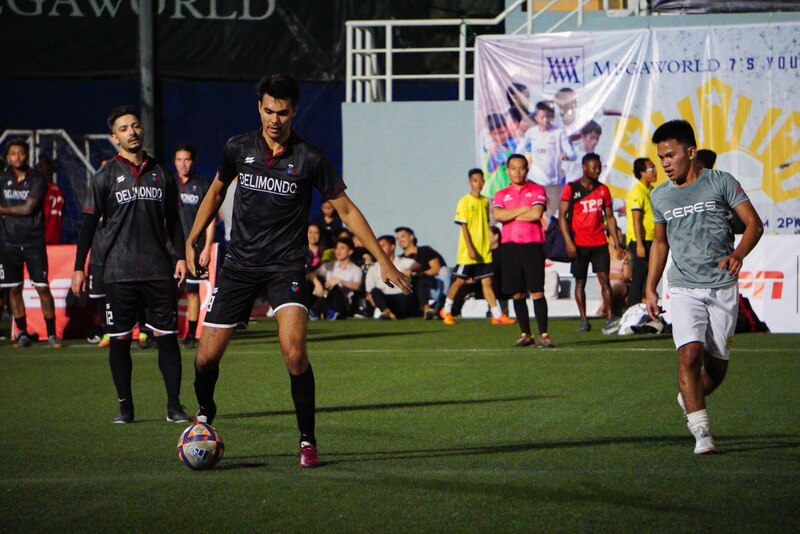 Coming into the game, Tondo FC did make some adjustments, mainly getting reinforcements from players from Marikina, something that Coach Mark Balbin is thankful for. After being down 0-1 and then 1-2 at the end of the first half, Bohemian made an epic comeback in the second half and scored the equalizer that sent the game to extra time. The extra five minutes was all that they needed to regroup in order to score the golden goal to seal their comeback with the win. “A come from behind win is always difficult. I think we started out a little bit too relaxed, Real Amigos came out with intensity, came out really with high pressure, I think out players were a bit too relaxed but then we got the first goal - unlucky because it was a rebound, they scored one goal, but you know that’s football, breaks of the game. But like you’ve said, we’ve kept our game, we continued to play our game, eventually, we were able to come back and get to 1-1. Then they were able to get to it again at 2-1 and then at the second half, I think we put on much pressure or intensity. We picked it up and we got to get the equalizer. In the last few seconds, they gave up a 6th foul and that’s a penalty so we got to 2-2, then I didn’t know that there was extra time. Anton was saying that there’s still 5 minutes of extra time and then we were able to get that golden goal and the victory,” said Coach Mikee Carrion. At the second set of games scheduled for Matchday 2, Superbad became the next team to have fallen into the Super Eagles’ prey. The defending champions led as much as 3-0 at the end of the first half and were even more resilient in protecting their lead at the second half, scoring five more goals to prove that they are determined to win the league title for the third time in a row. “I think it was just hard work and determination. We are the defending champions and we are committed, we really want to win again. I don’t need to say that they will fall into our prey because it is all about 7 versus 7 but in the game of soccer, anything can happen. But I just want to assure you that Super Eagles is going to win, there is no doubt about it, we are going to win,” a very satisfied Coach Prince said. At the other side of the field, Delimondo-Laro FC and Ceres FC were inseparable at the first half, giving the fans present at the stadium an all the more exciting game as they anticipate which of these two teams will draw first blood. Ceres FC went on to take the lead at the beginning of the second half, but Delimondo-Laro FC was able to equalize not long enough. Another goal scored by Ceres broke the lead but it was not for long as Delimondo-Laro FC was able to bounce back, scoring another goal from the penalty area and then eventually scoring another one to seal off their come from behind win. “We pushed a bit more, then they got the lead then we pushed again to pressure them after they got the lead again, we kept on pushing. I think our game tonight was more entertaining in the second half compared to the first one,” said Joaco Canas in the post-match interview. For the last batch of fixtures of Matchday 2, Ghana FC lived up to their statement from opening day that they will give each team a run for their money as they led against Stallion Laguna FC at the end of the first half. However, Stallion Laguna tried to make a comeback at the start of the second half only to fall short against the league runner-ups. “It was a very intense game, Stallions is one of the professional teams in the Philippines and they even started training before the season began, they prepared really well. Playing against them, you know, it’s really going to be tough. Our game plan today was to play 3 defenders, 2 midfielders and one attacker, first half, we scored the only one which we tried to hold down to the 1 up until halftime and then we got another goal at the start of the second half, which is really a good goal. Then when we conceded a goal, we started panicking especially when we conceded a penalty, good thing our goalie saved it, and then less than two minutes later, another penalty which our goalie saved again. We have to give all the glory to our goalkeeper for saving those two penalties,” Coach Ayi Bimbo narrated. “It was so hard, really wasn’t easy. 2 players down and our Coach is out. It’s very frustrating but we came together, we played together as a team and focused at the game, played how it is.” Sam Yakubu, who scored the winning goal, added. Deportivo Matu, on the other hand, lived up to extend their winning streak as they trounced Futbol Fanatics with a clean sheet, 5-0. “Great feeling, obviously, especially being here, great people, a lot of people supporting us. It started off really rough. First half, I think we manage to have a lot of composure when Nico starting, obviously and we managed to keep the ball quite well, we managed to keep them out of our 6 meters because it is the most important thing for us – starting off and then we capitalized it on the second half so we’re quite satisfied with that,” Coach Chris Johnson said after the game.